Today is my stop during the By Blood blog tour. 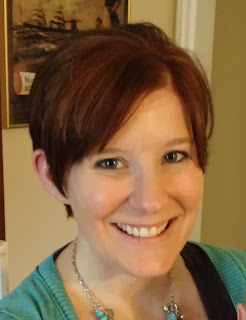 I review both By Blood and Moon Child by Tracey Banghart! Blurb from Goodreads: For 17-year-old Emma Wong, spending a summer in England should be a dream come true. Gorgeous scenery? Check. Lots of hot guys with accents? Yes, please. This book get’s a solid 4 stars, maybe even a 4.5 stars. I really enjoyed this book, it has the perfect combination of drama, fantasy and mystery and sometimes even a little bit scary. I really enjoyed it! The story is really consistent in it’s enjoyabilty and pacing. When I started this book I had forgotten most of the blurb already, I only remembered the main character was visiting England and that was explained pretty soon in the book too. Emma has to spend the summer with her mom, her mom’s new boyfriend and their baby. And she is not exactly looking forward to it. Emma could be a bit annoying at the beginning, but I could understand why she was acting like that. Instead of enjoying her summer she is stuck in another country, with people she hardly knows or is holding a bit of a grudge against. I really liked the story and how it progressed and because I had forgotten the blurb I was really surprised when the druids where introduced. The story has some predictable moments, but it really surprised me too. There are some twists and turns I really didn’t see coming and one twist I did see coming, but the main character didn’t. The pacing was really consistent trough the whole book and there where no boring parts. I basically read this book in two sittings, because as soon as I picked this book up I couldn’t stop reading. This book has a perfect combination of drama and mystery. We mainly get to know Emma in this book, because the focus is on her. Also some of her new friends and a bit about her family. I really liked Emma as a characters, she did make some dumb descisions and acted a bit nasty towards her mom in the beginning, but I could understand why she acted the way she did. I liked how her relationship with her mom progressed. I also liked Ash and Josh and would’ve liked getting to know them better. There is also a sort of love triangle in this book. I wasn’t really a fan of the love triangle, but I liked how it turned out in the end. Also while there is some romance in this book, it’s only part of the story. Other parts of the story are Emma’s relationship with her family, her new friends, exploring Oxford and everythign surrounding the druids. There is not a whole lot of world building in this book, but I really liked the way the magic/fantasy element was handled. It felt real, like this really could be happening. There wasn’t a whole new world, just some magic that might or might not be real. And at the end I am still wodnering what exactly happened. There is no clear explanation, but the whole druid thing is handled so well. I really liked the fantasy/magic aspect and the idea of druids was fairly original. To conclude: I really liked this book, the pacing and ejoyability was really conistent and there where no dull moments. I got sucked into the story and read it basically in two sittings. I did like Emma, but would’ve liked getting to know the side characters a bit better. I wasn’t a fan of the love triangle, but I did like the end. I also really liked how the druid thing was handled in this book, a lot of mystery and not a lot of world building, but it worked so well. I am looking forward to reading more from this author! I really enjoyed By Blood and was really excited to start Moon Child right afterwards. 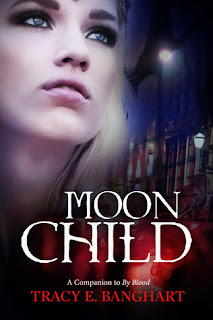 While I really enjoyed By Blood, I think Moon Child didn’t quite reach the same level of enjoyableness as the first book. 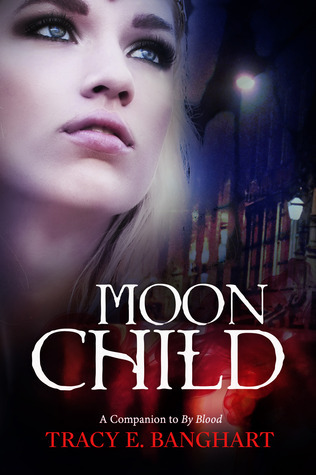 I enjoyed reading Moon Child, but I also had some issues with it. I finished it fairly quickly, but I just expected more from this book because the first book was so good. There wasn’t as much mystery as in the first book. The storyline was interesting, but it was predictable quite often at the end there are some nice twists later on in the book. Part of this book is about a murder mystery, but while normally with such kind of books I keep guessing who the murderer will be, I didn’t do that in this book. There weren’t enough hitns and actualy the police didn’t know anything at all, the murdered really could be anyone. The murder mystery just didn’t pull me in, there where no suspicions and I didn’t have any speculations either as result of that. If I am correct this book is supposed to take place before By Blood where Emma leaves for England. So I was a bit surprised when I read this book, that I can’t remember eny of these events being mentioned in By Blood. A big part of this story felt horribly cliché and predictable. I was really glad when later on in the story there were some plot twists and surprises. I did like Diana, she was a nice character. Although sometimes it did feel like Emma acted in this book how Diana acted in By Blood and in some scenes I didn’t feel like Emma was the same character I got to know in By Blood. And also the other way around, Diana didn’t felt like the same person as in By Blood. I did like Diana in in this book, she was a strong character and could stand up for herself. She makes some stupid mistakes along the way, but overal she felt real and believeable. I still didn’t get a good idea of who Helen was, even though these 3 are quite close the focus is more on Emma and Diana in this book. Also Diana tells Emma quite a lot of what is going on, but in By Blood Emma keep almost everything a secret from Diana, which really surprises me because they seem really close in this book. I did like the romance in this book more than in BY Blood. I like Nicolas and their romance felt genuine. I liked Diana and Nicolas together, their romance was really sweet and done really well. I do wonder what happened to Nicolas as I don’t remember him being mentioned in By Blood. To conclude: I enjoyed Moon Child, but it just missed something to make it more than okay for me. I did like the story, but I kept comparing it to the first book in this series and trying to make connections between these two books. 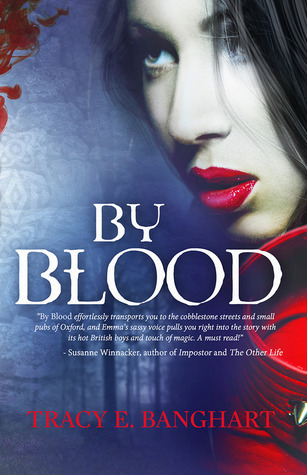 I liked the story and mystery better in BY Blood, but I think the romance was done better in this book. I also think Diana is a great character.